I have a real soft spot for clocks… The clock is like the toaster or the chair, it’s an excellent object to flex design muscle, and there’s no shortage of amazing and fun solutions for telling time. 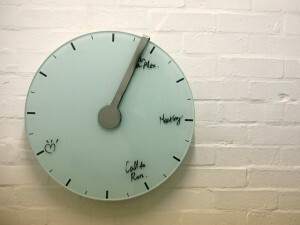 Designer Il-Gu,Cha has come up with a real fun hybrid between a clock and a white board for scheduling. You write in events at the time they need to happen, and as the hour hand of the clock circles the face, it erases the events. Some day I’ll have a wall full of clocks, and I hope this one will be on there.